Impressive mare Little King Robin won the WKD Hurdle on day one of the Northern Ireland Festival of Racing at Down Royal as Triumph Hurdle winner Tiger Roll was pulled up. Colin Bowe's six-year-old was clinching her seventh victory of 2014. Ridden by Mark Walsh, Little King Robin opened up a big early lead and came in three lengths ahead of Willie Mullins's 2-1 favourite Arctic Fire. The mare was priced at 9-2 with 33-1 shot Orgilgo Bay a distant third. Little King Robin has been one of the success stories of the National Hunt scene in Ireland this year and arrived at Down Royal after an impressive win at Punchestown a fortnight ago. Friday's Grand Two race was a step up in class again for the Wexford-based trainer's horse but the mare passed the test with flying colours. Last year's race winner Jezki went on to land the Champion Hurdle at Cheltenham in March. Winning trainer Bowe was thrilled with his star's latest success. "She has just kept improving so we couldn't let her off," added Bowe. "It was a big decision to come here [she was in a mares race at Wetherby on Saturday] but she had been winning her mares' races. "We thought we would have a crack at it. She got passed and she battled back. She's tough. "The long-term plan is the Mares' Hurdle [at the Cheltenham Festival]. She'll probably have one more run before then and it could be at Christmas in Leopardstown for the mares' race." Tiger Roll was pulled up with three to jump while Guitar Pete, a Grade One winner at the Grand National meeting in April, finished a tired last. 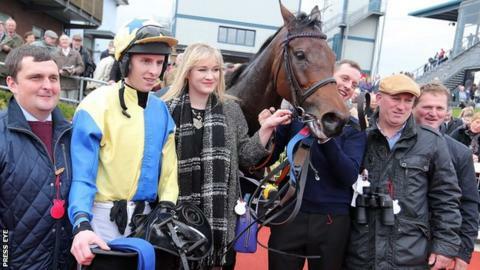 Earlier, Morning Run kept her unbeaten record intact with another demolition of her rivals in the Mares Novice Hurdle. After initially tracking the pace, Ruby Walsh soon let the 8-15 favourite stride on at the head of affairs and she eventually finished almost eight lengths clear of 9-2 shot Carrigmoorna Rock with Melbourne Lady [14-1] as far back again in third.